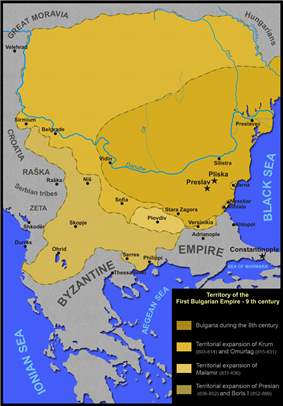 The First Bulgarian Empire (modern Bulgarian: Първo българско царство, Parvo Balgarsko Tsarstvo) is the historiographical term for the khanate founded by the Bulgars circa 681, when they settled in the northeastern Balkans, subdued or drove out the Byzantines and made the South Slavic settlers their allies. It evolved into a principality in 864 and an empire around 913-927. At the height of its power Bulgaria spread from the Danube Bend to the Black Sea and from the Dnieper River to the Adriatic Sea. As the state solidified its position in the Balkans, it entered on a centuries-long interaction, sometimes friendly and sometimes hostile, with the Byzantine Empire. Bulgaria emerged as Byzantium's chief antagonist to its north, resulting in several wars. The two powers also enjoyed periods of peace and alliance, most notably during the Second Arab siege of Constantinople, where the Bulgarian army broke the siege and destroyed the Arab army, thus preventing an Arab invasion of Southeastern Europe. Byzantium had a strong cultural influence on Bulgaria, which also led to the eventual adoption of Christianity in 864. After the disintegration of the Avar Khaganate, the country expanded its territory northwest to the Pannonian Plain. 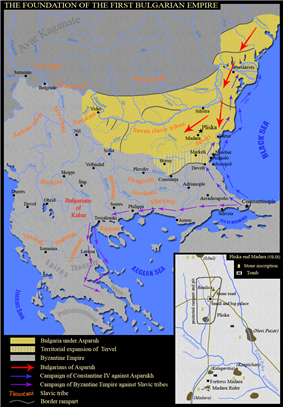 Later the Bulgarians confronted the advance of the Pechenegs and Cumans, and achieved a decisive victory over the Magyars, forcing them to establish themselves permanently in Pannonia. During the late 9th and early 10th centuries, Simeon I achieved a string of victories over the Byzantines, and was recognized with the title of Emperor, and expanded the state to its greatest extent. After the annihilation of the Byzantine army in the battle of Anchialus in 917, the Bulgarians laid siege to Constantinople in 923 and 924. The Byzantines eventually recovered, and in 1014 under Basil II, inflicted a crushing defeat on the Bulgarians at the Battle of Kleidion. By 1018, the last Bulgarian strongholds had surrendered to the Byzantine Empire, and the First Bulgarian Empire had ceased to exist. It was succeeded by the Second Bulgarian Empire in 1185. Between the 7th and 10th centuries, the Bulgars and other tribes in the empire gradually became absorbed by the more numerous Slavs, adopting a South Slav language. Since the late 10th century, the names Bulgarians and Bulgarian became prevalent and became permanent designations for the local population, both in the literature and in the spoken language. The development of Old Church Slavonic literacy had the effect of preventing the assimilation of the South Slavs into neighboring cultures, while stimulating the formation of a distinct Bulgarian identity. 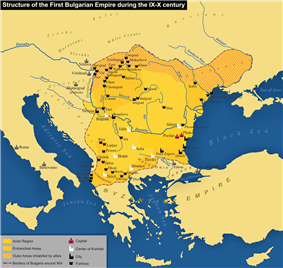 The First Bulgarian Empire became known simply as Bulgaria since its recognition by the Byzantine Empire in 681. Some historians use the terms Danube Bulgaria, First Bulgarian State, or First Bulgarian Tsardom (Empire). Between 681 and 864 the country was also known as the Bulgarian Khanate, Danube Bulgarian Khanate, or Danube Bulgar Khanate in order to differentiate it from Volga Bulgaria, which emerged from another Bulgar group. During its early existence, the country was also called the Bulgar state or Bulgar qaghnate. Between 864 and 917/927, the country was known as the Principality of Bulgaria or Knyazhestvo Bulgaria. 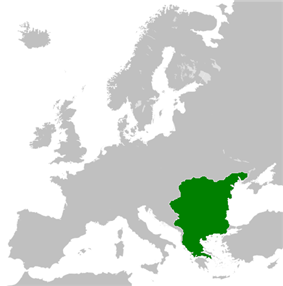 In English language sources, the country is often known as the Bulgarian Empire. Created as a union between Bulgars and Slavs, for mutual protection against the Byzantine Empire to the south and the Avars to the north-west, the First Bulgarian Empire was ruled according to Bulgar tradition with the head of state being the Khan. The Slavs kept significant autonomy and eventually their language and traditions shaped the Bulgarian culture and people with Bulgaria becoming a Slavic country. During the time of the late Scythia Minor, Moesia (Upper and Lower), Thrace, Macedonia (First and Second), Dacia (north of the Danube), Dardania, Rhodope and Hermimont, and had a mixed population of Romanized Getae and Hellenized Thracians. Several consecutive waves of Slavic migration throughout the 6th and early 7th centuries led to the almost complete Slavicization of the region, at least linguistically. The Bulgars also included the tribes of Onogurs, Utigurs and Kutrigurs. Between 630 and 635, Khan Kubrat managed to unite the main Bulgar tribes, creating a powerful confederation called Old Great Bulgaria, also known as Onoguria. Under strong Khazar pressure Old Great Bulgaria disintegrated in 668. Afterwards Khan Asparuh parted ways to seek a secure home. It is difficult to estimate the number of Asparuh's Bulgars, Zlatarski posits that their number was not great, on the contrary Runciman consider that the tribe must have been of considerable dimension. In 680 Asparukh founded after the Battle of Ongal the First Bulgarian Empire, south of the Danube on Byzantine territory. It was officially recognized as an independent state by the Byzantine Empire in 681. 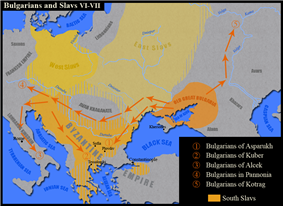 It is likely that the original Bulgars were greatly outnumbered by the Slavic population among whom they were settled. 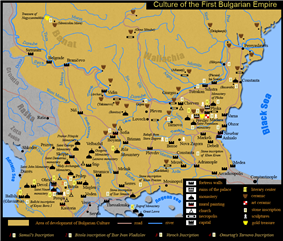 Between the 7th and the 10th centuries, the Bulgars gradually became absorbed by the Slavs, adopting a South Slav language and converting to Christianity (of the Byzantine rite) under Boris I of Bulgaria in 864. Modern Bulgarians are normally considered to be of Southern Slavic origin. However, the Slavs were only one of the communities that had been present in the area conquered by Bulgars, themselves being recent migrants in the Balkans. Several other peoples were eventually absorbed into the new ethnicity. At that time the process of absorption of the remnants of the old Thraco-Roman and Thraco-Byzantine population had already been significant in the formation of this new ethnic group. The new single identity nation would continue to identify as Bulgarian and uphold the eponymous state as its own. Modern Bulgarians continue to celebrate the original non-Slavic Bulgar state and Thracian ancestors, while embracing a Slavic identity at the same time. Khan Sevar, the last scion of the Dulo clan, died in 753. With his death the Khanate fell into a long political crisis during which the young country was on the verge of destruction. In just fifteen years, seven Khans ruled, all of whom were murdered. There were two main factions: some nobles wanted uncompromising war against the Byzantines, while others searched for a peaceful settlement of the conflict. That instability was used by the Byzantine Emperor Constantine V (745–775), who launched nine major campaigns aiming to eliminate Bulgaria. In 763 he defeated the Bulgarian Khan Telets at Anchialus, but the Byzantines were unable to advance further North. In 775 Khan Telerig tricked Constantine into revealing those loyal to him in the Bulgarian Court, then executed all the Byzantine spies in the capital Pliska. Under his successor Khan Kardam, the war took a favourable turn after the great victory in the battle of Marcelae in 792. The Byzantines were thoroughly defeated and forced once again to pay tribute to the Khans. As a result of the victory, the crisis was finally overcome, and Bulgaria entered the new century stable, stronger, and consolidated. Under the great Khan Krum (803–814), also known as Crummus and Keanus Magnus, Bulgaria expanded southward and to the northwest, occupying the lands between the middle Danube and Moldova, the whole territory of present-day Romania, Sofia in 809 and Adrianople (modern Edirne) in 813, threatening Constantinople itself. Between 804 and 806 the Bulgarian armies thoroughly eliminated the Avar Khanate and a border with the Frankish Empire was established along the middle Danube. In 811 a large Byzantine army was decisively defeated in the battle of the Varbitsa Pass. The Byzantine Emperor Nicephorus I was slain along with most of his troops, and his skull was used as a drinking cup. Krum immediately took the initiative and moved the war towards Thrace, defeating the Byzantines once more at Versinikia in 813. After a treacherous Byzantine attempt to kill the Khan during negotiations, Krum pillaged the whole of Thrace, seized Odrin, and resettled its 10,000 inhabitants in "Bulgaria across the Danube". He made enhanced preparation to capture Constantinople: 5,000 iron-plated wagons were built to carry the siege equipment; the Byzantines even pleaded for help from the Frankish Emperor Louis the Pious. Due to the sudden death of the great Khan, however, the campaign was never launched. Khan Krum implemented legal reform, establishing equal rules and punishment for all peoples living within the country's boundaries, intending to reduce poverty and to strengthen the social ties in his vastly enlarged state. Khan Omurtag (814–831) concluded a 30-year peace treaty with the Byzantines, thus allowing both countries to restore their economies and finance after the bloody conflicts in the first decade of the century. The northwestern boundaries with the Frankish Empire were firmly settled along the middle Danube by 827. Extensive building was undertaken in the capital Pliska, including the construction of a magnificent palace, pagan temples, ruler's residence, fortress, citadel, water-main, and bath, mainly from stone and brick. 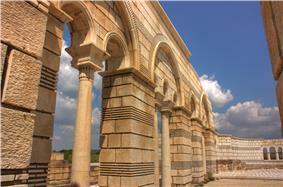 During the short reign of Khan Malamir (831–836), the important city of Plovdiv was incorporated into the country. Under Khan Presian (836–852), the Bulgarians took most of Macedonia, and the borders of the country reached the Adriatic and Aegean Seas. Byzantine historians do not mention any resistance against the Bulgarian expansion in Macedonia, leading to the conclusion that the expansion was largely peaceful. Between 839 and 842 the Bulgarians waged war on the Serbs but did not make any progress. In 864 the Byzantines under Michael III invaded Bulgaria on suspicions that Khan Boris I prepared to accept Christianity in accordance with the Western rites. Upon the news of the invasion, Boris I started negotiations for peace. The Byzantines returned some lands in Macedonia and their single demand was that he accept Christianity from Constantinople rather than Rome. Khan Boris I agreed to that term and was baptised in September 865 assuming the name of his godfather, Byzantine Emperor Michael, and became Boris-Mihail. The pagan title "Khan" was abolished and the title "Knyaz" assumed in its place. The reason for the conversion to Christianity, however, was not the Byzantine invasion. The Bulgarian ruler was indeed a man of vision and he foresaw that the introduction of a single religion would complete the consolidation of the emerging Bulgarian nation, which was still divided on a religious basis. He also knew that his state was not fully respected by Christian Europe and its treaties could have been ignored by other signatories on religious basis. Тhe Byzantines' goal was to achieve with peace what they were unable to after two centuries of warfare: to slowly absorb Bulgaria through the Christian religion and turn it into a satellite state, as naturally, the highest posts in the newly founded Bulgarian Church were to be held by Byzantines who preached in the Greek language. Knyaz Boris I was well aware of that fact and after Constantinople refused to grant autonomy of the Bulgarian Church in 866, he sent a delegation to Rome declaring his desire to accept Christianity in accordance with the Western rites along with 115 questions to Pope Nicolas I. The Bulgarian ruler desired to take advantage of the rivalry between the Churches of Rome and Constantinople as his main goal was the establishment of an independent Bulgarian Church in order to prevent both the Byzantines and the Catholics from exerting influence in his lands through religion. The Pope's detailed answers to Boris' questions were delivered by two bishops heading a mission whose purpose was to facilitate the conversion of the Bulgarian people. However, Nicolas I and his successor Pope Adrian II also refused to recognize an autonomous Bulgarian Church, which cooled the relations between the two sides, but Bulgaria's shift towards Rome made the Byzantines much more conciliatory. 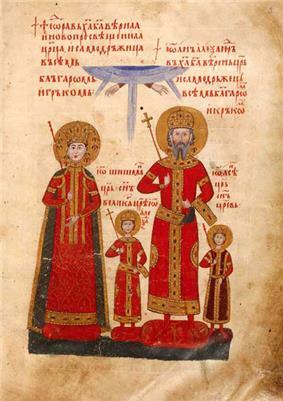 In 870, at the Fourth Council of Constantinople, the Bulgarian Church was recognized as an Autonomous Eastern Orthodox Church under the supreme direction of the Patriarch of Constantinople. It was the first Church officially accepted, apart from the Churches of Rome and Constantinople. Eventually, in 893, the Old Bulgarian language became the third official language, recognized by the Churches and used during services and in Christian literature. After the adoption of Christianity the country preserved many institutions from the pagan state of the Bulgars. Although the Bulgarian Knyaz succeeded in securing an autonomous Church, its higher clergy and theological books were still Greek, which impeded the efforts to convert the populace to the new religion. Between 860 and 863 the Byzantine monks of Greek origin Saint Cyril and Saint Methodius created the Glagolitic alphabet, the first Slavic alphabet by order of the Byzantine Emperor, who aimed to convert Great Moravia to Orthodox Christianity. However, these attempts failed and in 886 their disciples Clement of Ohrid, Naum of Preslav and Angelarius, who were banished from Great Moravia, reached Bulgaria and were warmly welcomed by Boris I. The Bulgarian Knyaz commissioned the creation of two theological academies to be headed by the disciples where the future Bulgarian clergy was to be instructed in the local vernacular. Clement was sent to Ohrid in Southwestern Bulgaria, where he taught 3,500 pupils between 886 and 893. Naum established the literary school in the capital Pliska, moved later to the new capital Preslav. During the Council of Preslav in 893, Bulgaria adopted the Glagolitic alphabet and Old Church Slavonic (Old Bulgarian) language as official language of the church and state, and expelled the Byzantine clergy. In the early 10th century the Cyrillic script was created at the Preslav Literary School. By the late 9th and the beginning of the 10th century, Bulgaria extended to Epirus and Thessaly in the South, Bosnia in the West and controlled the whole of present-day Romania and Eastern Hungary to the North. The Serbian state came into existence in the mid-9th century as a response to the Bulgarian expansion West of the Morava. Switching loyalties between Bulgaria and the Byzantines, the Serb rulers successfully resisted several Bulgarian invasions until 924 AD, when they were fully subordinated under the general and possibly Count of Sofia Marmais. Under Tsar Simeon I (Simeon the Great), who was educated in Constantinople, Bulgaria became again a serious threat to the Byzantine Empire and reached its greatest territorial extension. Simeon I hoped to take Constantinople and fought a series of wars with the Byzantines throughout his long reign (893–927). The border close to the end of his rule reached the Northern limits of Attica in the South. Simeon I styled himself "Emperor (Tsar) of the Bulgarians and Autocrat of the Greeks", a title which was recognized by the Pope, but not by the Byzantine Emperor nor the Ecumenical Patriarch of the Eastern Orthodox Church. He was recognized "Emperor (Tsar) of the Bulgarians" by the Byzantine Emperor and the Patriarch only at the end of his rule. Simeon sends envoys to the Fatimid Caliph to form an alliance against the Byzantines. Between 894 and 896 he defeated the Byzantines and their allies the Magyars in the "Trade War", so-called because the pretext of the war was the shifting of the Bulgarian market from Constantinople to Thessaloniki (Solun). 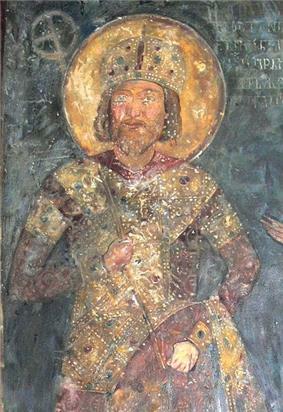 In the decisive battle of Bulgarophygon, the Byzantine army was routed, and the war ended favourably for Bulgaria, though the peace was often violated by Simeon I. In 904 he captured Solun, which was previously looted by the Arabs, and returned it to the Byzantines only after Bulgaria received all Slavic-populated areas in Macedonia and 20 fortresses in Albania, including the important town Drach. After the unrest in the Byzantine Empire following the death of Emperor Alexander in 913, Simeon I invaded Byzantine Thrace, but he was persuaded to stop in return for official recognition of his Imperial title and marriage of his daughter to the infant Emperor Constantine VII. Simeon I was supposed to become regent of the Emperor and to temporarily rule the Byzantine Empire. However, after a plot in the Byzantine court, Empress Zoe, mother of Constantine VII, rejected the marriage and Simeon's title, and both sides prepared for a decisive battle. By 917 Simeon I broke every attempt of the Empire to form an alliance with the Magyars, the Pechenegs, and the Serbs, and the Byzantines were forced to fight alone. On 20 August the two armies clashed at Anchialus in one of the greatest battles in the Middle Ages. The Byzantines suffered an unprecedented defeat, leaving 70,000 killed on the battlefield; the pursuing Bulgarian forces defeated the remainder of the enemy armies at Katasyrtai. Constantinople was saved by a Serb attack from the West; the Serbs were thoroughly defeated, but their attack allowed the Byzantine admiral and later Emperor Romanos Lakepanos to prepare the defense of the city. In the following decade the Bulgarians gained control of the whole Balkan peninsula with the exception of Constantinople and Peloponnese. In a Croatian–Bulgarian battle of 926, often called the Battle of the Bosnian Highlands, Duke Alogobotur attacked Croatia. The Croatian forces under the leadership of their King Tomislav completely devastated the Bulgarian army and stopped Simeon's expansion westwards. After Simeon's death in 927, Bulgarian power slowly declined. In a peace treaty the same year, the Byzantines officially recognized the Imperial title of his son Peter I and the Bulgarian Patriarchate. Peace with Byzantium, however, did not bring prosperity to Bulgaria. From the beginning of his rule, Peter faced internal problems and unrest with his brothers, and in the 930s he was forced to recognize the independence of Rascia. The biggest blow came from the North: between 934 and 965 the country suffered five Magyar invasions. In 944 Bulgaria was attacked by the Pechenegs, who looted the northeastern regions of the Empire. Under Peter I and Boris II the country was divided by the egalitarian religious heresy of the Bogomils. In 968 the country was attacked by the Kievan Rus, whose leader Svyatoslav I took Preslav and established his capital at Preslavets. 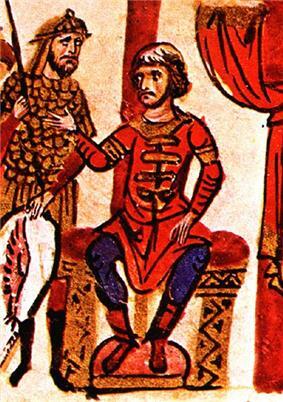 Three years later, Byzantine Emperor John I Tzimiskes intervened in the struggle and defeated Svyatoslav at Dorostolon. 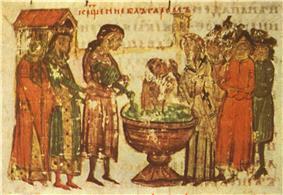 Boris II was captured and ritually divested of his imperial title in Constantinople, and eastern Bulgaria was proclaimed a Byzantine protectorate. After the Byzantine takeover, the lands to the west of the Iskar River remained in Bulgarian hands, and resistance against the Byzantines was headed by the Comitopuli brothers. By 976, the fourth brother, Samuil, concentrated all power in his hands after the deaths of his eldest brother. When the rightful heir to the throne, Roman, escaped from captivity in Constantinople, he was recognized as Emperor by Samuil in Vidin, and the latter remained the chief commander of the Bulgarian army. A brilliant general and good politician, he managed to turn the fortunes to the Bulgarians. The new Byzantine Emperor Basil II was decisively defeated in the battle of the Gates of Trajan in 986 and barely escaped. Five years later he eliminated the Serbian state of Rascia. 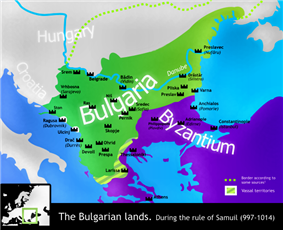 In 997, following the death of Roman, the last heir of the Krum dynasty, Samuil was proclaimed Emperor of Bulgaria. After 1001, however, the war turned in favor of the Byzantines, who captured the old capitals of Pliska and Preslav, and beginning in 1004 launched annual campaigns against Bulgaria. 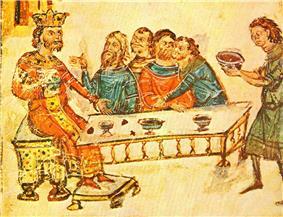 The Byzantines further benefited from a war between Bulgaria and the newly established Kingdom of Hungary in 1003. The Byzantine victories at Spercheios and Skopje decisively weakened the Bulgarian army, and in annual campaigns, Basil methodically reduced the Bulgarian strongholds. Eventually, at the Battle of Kleidion in 1014, the Bulgarians were completely defeated. The Bulgarian army was captured; it is said that 99 out of every 100 men were blinded, with the remaining hundredth man left with one eye so as to lead his compatriots home (earning Basil the moniker "Bulgaroktonos", the Bulgar Killer). When Tsar Samuil saw the broken remains of his army, he suffered a heart attack and died. By 1018, the last Bulgarian strongholds had surrendered and the First Bulgarian Empire was abolished. The Madara Rider (c. 710), large rock relief carved on the Madara Plateau east of Shumen, northeast Bulgaria. The cultural heritage of the First Bulgarian Empire is usually defined in Bulgarian historiography as the Pliska-Preslav culture, named after the first two capitals, Pliska and Preslav, where most of the surviving monuments are concentrated. Many monuments of that period have been found around Madara, Shumen, Novi Pazar, the village of Han Krum in north-eastern Bulgaria, as well in the territory of modern Romania, where Romanian archaeologists called it the "Dridu culture" Remains left by the First Empire have also been discovered in southern Bessarabia, now divided between Ukraine and Moldova. The most important feature of the early Bulgarian architecture was monumental construction known to the Romans but not used in the contemporary Byzantine Empire. There were two main types of construction employed in the building of Pliska. For the first one the construction materials were timber and bricks. The second type was construction of defensive walls using large carved limestone blocks put together with plaster. The same method was used in the construction of the fortress of Preslav, the military camp at Han Krum, the hunting palace in Madara, and in the fortress on the island of Păcuiul lui Soare. Fortresses were mainly situated in the plains, unlike those constructed during the Second Bulgarian Empire. After the adoption of Christianity in 864, intensive construction of churches and monasteries began throughout the Empire, including the Great Basilica of Pliska, which was one of the biggest structures of the time with its length of 99 m, and the splendid Golden Church in Preslav. Most of the churches built during that period had three naves. 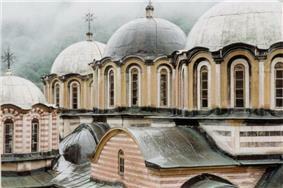 The Bulgarian capital was also famous for the ceramics that adorned its public and religious buildings. Beautiful icons and church altars were made of special ceramic tiles. There were numerous goldsmith and silversmith workshops producing fine jewellery. One of the most famous features of the Pliska-Preslav culture was the decoration of palaces and churches with lacquered ceramic plates, which may indicate a Near Eastern (Arabic) influence. The ceramic plates were painted mostly with geometric or vegetative elements, while a few feature depictions of saints. Among the most notable of those is the well-preserved, 20-tile Icon of St Theodore, found in the ruins of the Saint Panteleimon Monastery in the outskirts of Preslav. The tiles were either flat or tubular and were arranged to form friezes of repeating motifs. Due to the destruction of Pliska and Preslav, only fragments and details of the ceramic decoration have survived. Most finds of tiles, as well as archaeological evidence of the workshops producing them, come from Preslav and the surrounding region (chiefly the village of Patleina). The main sources for Bulgarian domestic use-oriented pottery are the necropoleis at Novi Pazar, Devnya, and Varna. The vessels were made with a potter's wheel, unlike Slavic practice. Two-story ovens were used for the annealing of the pottery. The shape and decoration of the early Bulgarian pottery was similar to that found in northern Caucasus, the Crimea, and the shores of the Sea of Azov. Bulgarian literature is the oldest Slavic literature. Missionaries from Thessalonica, Cyril and Methodius, devised the Glagolitic alphabet, which was adopted in the Bulgarian Empire around 886. The alphabet and the Old Bulgarian language gave rise to a rich literary and cultural activity centered around the Preslav and Ohrid Schools, established by order of Boris I in 886. 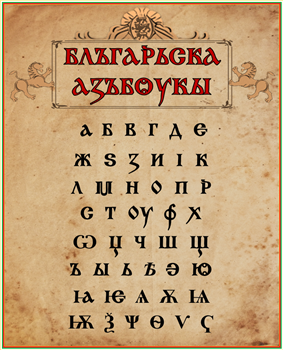 In the beginning of the 10th century, a new alphabet — the Cyrillic script - was developed on the basis of Greek and Glagolitic cursive at the Preslav Literary School. According to an alternative theory, the alphabet was devised at the Ohrid Literary School by Saint Clement of Ohrid, a Bulgarian scholar and disciple of Cyril and Methodius. A pious monk and hermit, St. Ivan of Rila (Ivan Rilski, 876–946), became the patron saint of Bulgaria. During his reign Simeon gathered many scholars in his court who translated an enormous number of books from Greek and wrote many new works. Among the most prominent figures were Constantine of Preslav, John Exarch, and Chernorizets Hrabar, who is believed by some historians to have been Simeon himself. Chernorizets Hrabar wrote his popular work An Account of Letters, Clement of Ohrid worked on translations from Greek and is credited with several important religious books, John Exarch wrote his Shestodnev and translated On Orthodox Christianity by John of Damascus, Naum of Preslav also had a significant contribution. Bulgarian scholars and works influenced most of the Slavic world, spreading Old Church Slavonic and the Cyrillic and Glagolithic alphabets to Kievan Rus', medieval Serbia, and medieval Croatia, as well as to non-Slavic medieval Wallachia and Moldavia. After the creation of the Bulgarian state, the Bulgars and the Slavs continued to practice their indigenous religions. The Bulgar religion was monotheistic, and they believed in Tangra, the God of the Sky. When Omurtag and Leo V the Armenian concluded a peace treaty in 815, the Byzantine Emperor had to make an oath according to the Bulgarian traditions. Byzantine historians recorded that the "most Christian" ruler had to perform different pagan rites including cutting dogs and using them as witnesses for his oath. The Slavs worshiped numerous deities, and their supreme god was Perun. There is evidence that Christianity remained widespread in Bulgaria during the first 150 years of its existence. 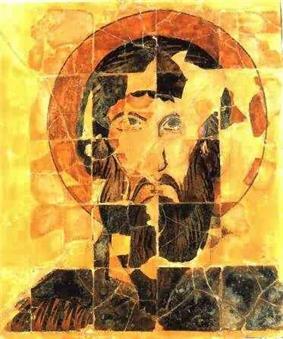 In the mid-9th century, Boris I decided to adopt Christianity in order to firmly unite the population of the country. a. [a] Bulgaria is usually accepted to have been established in 681 when the Byzantine Empire acknowledged the country as a sovereign state in a treaty. However, only some Bulgarian historians maintain a fringe view that Bulgaria existed since 632 with the creation of Old Great Bulgaria by Khan Kubrat in today Ukraine. ^ An historical geography of Europe, 450 B.C.-A.D. 1330, Norman John, CUP Archive, 1977, ISBN 0-521-29126-7, p. 179. Google Books. 28 January 1977. Retrieved 2011-11-13. ^ The early medieval Balkans: a critical survey from the sixth to the late twelfth century, John Van Antwerp Fine, University of Michigan Press, 1991, ISBN 0-472-08149-7 p. 68. Google Books. 15 May 1991. Retrieved 2011-11-13. ^ "Formation of the Bulgarian Nation, Academician Dimitŭr Simeonov Angelov, Summary, Sofia-Press, 1978". Kroraina.com. Retrieved 2011-11-13. ^ a b L. Ivanov. Essential History of Bulgaria in Seven Pages. Sofia, 2007. ^ Who are the Macedonians? Hugh Poulton, C. Hurst & Co. Publishers, 2000, ISBN 1-85065-534-0, pp. 19-20. ^ Bulgaria, Oxford University Press, 2007, ISBN 0-19-820514-7, p. 14. ^ Sophoulis, Panos (2011). Byzantium and Bulgaria, 775-831. Brill. p. 89. ^ The Other Europe in the Middle ages: Avars, Bulgars, Khazars, and Cumans, Florin Curta, BRILL, 2008, ISBN 9004163891, p. 351. ^ Васил Н. Златарски. История на Първото българско Царство. Епоха на хуно-българското надмощие с. 188. ^ The New Cambridge Medieval History: Volume 1, c. 500 - c. 700, Paul Fouracre, Cambridge University Press, 2005, ISBN 0521362911, p. 301. ^ Мутафчиев, П. Гюзелев. В, История на българския народ 681-1323. Българска Академия на науките, 1986. стр. 106-108. Andreev, Jordan; Milcho Lalkov (1996). The Bulgarian Khans and Tsars (in Bulgarian). Abagar. Бакалов, Георги; Милен Куманов (2003). Електронна издание – История на България (in Bulgarian). София: Труд, Сирма. Цанев, Стефан (2006). Български хроники (in Bulgarian). София, Пловдив: Труд, Жанет 45. Българите и България (in Bulgarian). Министерство на външните работи на България, Труд, Сирма. 2005. Fine, Jr., John V.A. (1991). The Early Medieval Balkans.